Myanmar has appealed for international assistance to help provide food, temporary shelter and clothing for more than 260,000 people affected by widespread flooding following weeks of heavy monsoon rains. Around 70 people have died in the floods as of August 5 and the death toll is set to rise, the United Nations have warned. More than 210,000 hectares of farmland across mainly northern parts of Myanmar, and low-lying southern regions are expecting more flooding. Four states and regions in the country – Chin, Magway, Sagaing and Rakhine – have been declared disaster zones, and many areas are completely cut off by high waters or because of damaged roads. Myanmar’s call for international aid stands in sharp contrast to stance taken when it was ruled by generals. The junta had refused outside help in the wake of a devastating cyclone in 2008, when 130,000 people perished in the disaster. While the quasi civilian government, which took power in 2011 and faces elections in November, is leading the relief effort, the military is handling operations on the ground. 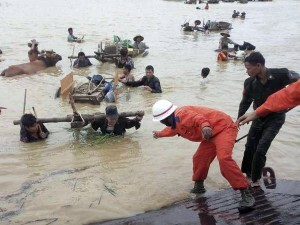 However, the government has admitted that its response to the floods was “weak” which hampered evacuation efforts, the official Global New Light of Myanmar newspaper wrote, quoting Information Minister Ye Htut as saying that flood warnings had not reached everyone, and there had been confusion over evacuations. Australia offered $2 million in emergency relief aid on August 5, and the US said it is preparing to send relief aid for tens of thousands of people affected by the floods which is already being coordinated with the Myanmar government. The UN Office for the Coordination of Humanitarian Affairs said agencies were scaling up their emergency response. It said the World Food Programme had started providing food rations to 47,800 people, with the aim of reaching 150,000 people eventually. The UN children’s agency UNICEF has distributed water purification and hygiene kits, and agencies are preparing to request for UN funds for financial support. The Japanese government has provided relief goods including blankets and plastic sheets worth around $150,000, according to a statement from the country’s embassy in Yangon, and Thailand has pledged a similar amount of aid. The Myanmar government itself has so far provided 1.5 billion Myanmar kyat ($1.2 million) in emergency aid, state media said. Non-governmental organisations, churches, foundations and private companies in the country are donating money and food, four private airlines – Air Bagan, Asian Wings, Myanmar Airways International and Air KBZ – are offering free cargo services, and various organisations and political parties in the neighbouring Indian state of Mizoram are holding charity events to collect flood aid.